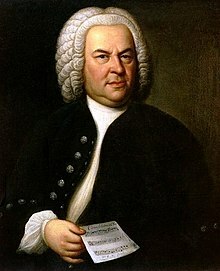 Johann Sebastian Bach (31 March 1685 – 28 July 1750) was a German composer, organist, harpsichordist, violist, and violinist whose sacred and secular works for choir, orchestra, and solo instruments drew together the strands of the Baroque period and brought it to its ultimate maturity. Although he did not introduce new forms, he enriched the prevailing German style with a robust contrapuntal technique, an unrivalled control of harmonic and motivic organisation, and the adaptation of rhythms, forms and textures from abroad, particularly from Italy and France. Revered for their intellectual depth, technical command and artistic beauty, Bach’s works include the Brandenburg concertos, the Goldberg Variations, the Partitas, The Well-Tempered Clavier, the Mass in B minor, the St Matthew Passion, the St John Passion, the Magnificat, The Musical Offering, The Art of Fugue, the English and French Suites, the Sonatas and Partitas for solo violin, the Cello Suites, more than 200 surviving cantatas, and a similar number of organ works, including the famous Toccata and Fugue in D minor and Passacaglia and Fugue in C minor, as well as the Great Eighteen Chorale Preludes and Organ Mass. Bach’s abilities as an organist were highly respected throughout Europe during his lifetime, although he was not widely recognised as a great composer until a revival of interest and performances of his music in the first half of the 19th century. He is now generally regarded as one of the main composers of the Baroque style, and as one of the greatest composers of all time.